Once again, historic Thespian Hall will be the primary venue for the Big Muddy Folk Festival, bringing to central Missouri some of the finest talent in the world of folk music. We hope you'll be able to join us. Use the menu at the left to see what we've lined up for you this year. Winter will be a more recent memory by the time our tenth annual festival rolls around. The snow and ice from the north country blew in on strong winds, leaving our little town covered long in a white blanket. The unusually abundant snow and time off from school made for an odd supply shortage - sleds. Can't find them anywhere in the area. Despite the precipitation, the Missouri River ran low, sometimes only four feet to float the ice flows. Over on Vine Street, Thespian Hall withstands the winter winds and waits for the Big Muddy Folk Festival. 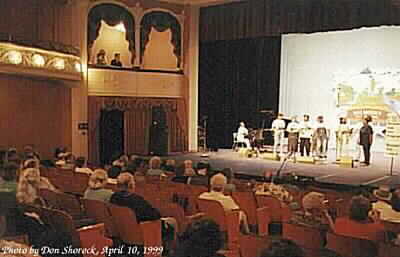 The year 2000 was a good one for the hall as the Missouri Cultural Trust established a $120,000 trust for maintenance. The City of Boonville added double that amount to the Friends of Historic Boonville for Thespian Hall from the money it has received for historic preservation from the Isle of Capri gaming company. The latter amount allows for extensive repairs and restoration, including the ceiling and echo dome, seat replacement, a new grand curtain, many exterior repairs and interior and exterior painting. The Friends will still have to raise additional money for other projects, including simply keeping the furnace on for the plaster repairs and improving the heating to allow use of the building during more of the year. Did I say it will be our tenth festival? We have had some great times during these past 10 years. This year we welcome back some old friends as well as some new ones and a great mix of folk styles, music and dance.